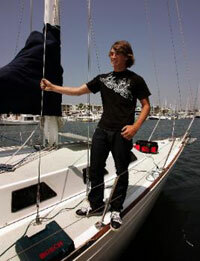 Zac Sunderland, 17, of California is the youngest person to sail around the world alone. He left the Los Angeles coast 13 months ago with a bold ambition to become the youngest person to sail around the world alone and returned to complete that quest yesterday morning, Boston Globe reports. With a large American flag unfurled behind his 36-foot vessel, Intrepid, Sunderland sailed into history at 10:30a.m. as he completed a 28,000-mile voyage with two world records - one of which will never be broken. In his moment of triumph, the unassuming teen with long surfer's hair, stovepipe jeans and deep religious faith told the world it should expect more of its youth. "Society puts younger people from 15 to 18 in a kind of a box, that no one is really expected to do much," Sunderland said in his first meeting with reporters after arriving home. "You know, they kind of just tend to go to high school and play football, and that's pretty much it, you know? "There's so much more potential that people can do with the right motivation and the right ambition in life, so, you know, my thing would just be to get out there and do hard things. Go for it," Los Angeles Daily News reports. Hundreds of people had lined the waterfront at Fisherman's Village. They clapped their hands and shouted, "You did it!" and at one point broke into a chorus of "God Bless America," The Los Angeles Times reports.